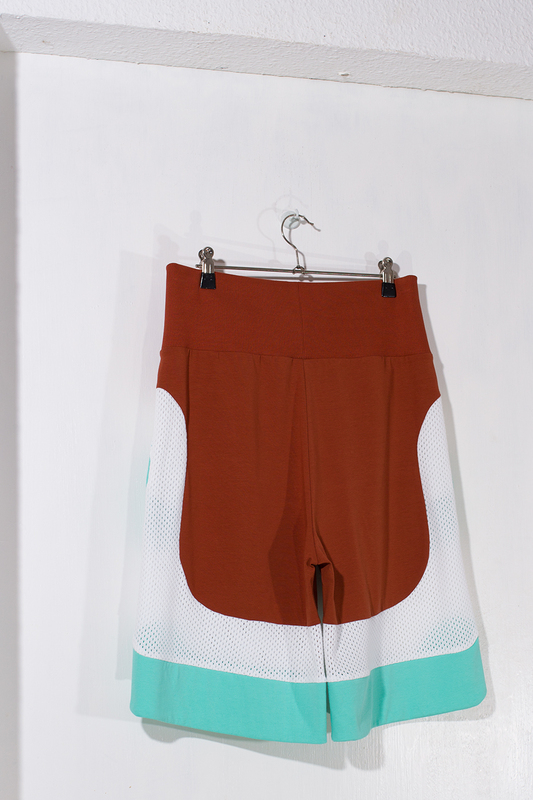 Partly see-through mesh shorts with abstracted flame pattern and pockets. White mesh and turquoise jersey in 100% cotton and henna jersey and ribbing in 95% cotton, 5% elastane. All fabrics are GOTS certified organic from Lebenskleidung. The thread used is both natural lyocell(white) and polyester(henna). Based on basket and boxing shorts, with wide legs and pockets in the sides. Extra wide elastic waistband. * Because of the strech the shorts fits people with hips ca 5-8 cm wider than measurement.